A little more light-hearted post today :) Let's talk SKIN! Recently I switched up two of my tried-and-true products, my cleanser and toner, for different brands. Now that I've been using both of the new products for a while, I thought I'd come back here to share my two cents. So, here are my new items -- Bliss Daily Detoxifying Facial Toner and Cerave Hydrating Cleanser. Here's how they stack up against my original favorites, Bobbi Brown Hydrating Face Tonic and Philosophy Purity Cleanser. I've been using Purity for several years now, but I couldn't turn down the price and dermatologist stamp-of-approval on CeraVe. I went with the hydrating line to (hopefully?) help combat some of the fine lines around my eyes that drive me nuts. 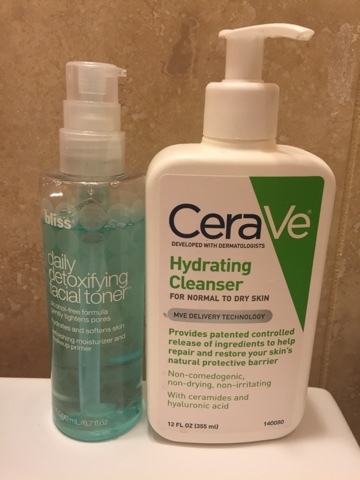 So here's what I think -- the CeraVe hydrating cleanser does a good job of cleaning my face makeup, but stubborn eye makeup often proves way too difficult for removal. Plus, it leaves my skin with a hydrating film feeling, which I know is probably a good thing, but it is just not the clean feeling that I've grown to love from Purity. I want to give the CeraVe foaming cleanser a shot, but if I don't love it as much as Purity, then back to Philosophy I will go. I used the Bobbi Brown toner for over two years before wanting to give the Bliss toner a shot. Lucky, I have a sweet friend who passed her bottle down to me since it just didn't work for her skin. I'd read a few reviews online that it does leave a somewhat moisturizing film on your skin that some reviewers called "soapy." I have definitely experienced that. I don't believe it has led to breakouts for me (it's not uncommon for me to get an occasional small one, but they are mainly hormone-related) but I still don't think it holds a candle to the Bobbi Brown toner. Even just for the smell alone! Bobbi Brown smells heavenly. Since the prices don't differ too much, it's not hard for me to justify the move back to Bobbi. If you have any star products for either of these fields, please share! I'd love to hear about any product recs you may have. I know a lot of people love CeraVe - including my mom - but I have never liked it much anytime I've tried it. I have an Olay sensitive wash that I love a lot more! As far as toners go, well, I don't currently use one so can't be of much help there. However, I am considering purchasing the Thayers witch hazel toner (on Amazon) because I've heard great things, it was created for sensitive skin, and the price is amazing ($10!!!) I'm looking forward to trying it! Too funny.. I've used purity for years and recently just tried that face wash!! I've been using the regular "Foaming Facial Cleanser" for normal to oily skin and feel like I like it as much as Purity. I also started using Say Yes to Carrots hypoallergenic facial wipes first before washing and my face has felt so clean and soft since switching to these two products. Not sure if it's just one or the other (or both!) but I think I'll stick to this routine for awhile. I do think Philosophy products are more expensive, but I would buy the big $52 bottle which lasted me FOREVER. In my mind it all broke down to the same price once you saw how long each cleanser last. My favorite cleanser is Johnson & Johnson purpose. It cleans my face without stripping my skin and I have been using it for years. CeraVe for normal to oily skin is great for me during the summer, but it might be harsh if your skin is a little drier. Good luck finding a new favorite! Coconut oil is my go to for eye makeup removal! Ahh I hear what you're saying about that "film" - I loathe that feeling. I switched using my Mia in the morning to pre-bed this summer and have seen a huge difference. Getting all the makeup and grit out of my skin BEFORE all of my serums and creams to soak in overnight... huge difference glow- and clarity-wise. Obsessed with the Mario Badsecu Vitamin C serum - $45 but a little goes a loooong way. I've been using Purity for several years now and I just love it. I can't bring myself to switch. It removes makeup like no other brand and really makes my face feel clean! I used witch hazel as toner for quite a while (I had read that it relieved redness, which I had been experiencing at the time). I really loved it and it truly did help with the redness. I LOVE the CereVe foaming wash, so maybe you will too! I will say though, it does not take off all my eye makeup, so I do use an eye makeup remover first. I converted from philosophy's purity made simple too - probably about 3 years ago now! I love the philosophy brand! I use(d) their facial cleanser and body wash for years! I recently became a distributor of ItWorks and thought I would try their cleanser and toner, and OMG I love it. I don't think I will ever be able to switch back! The price is around $33 for both as well, which you can't beat that. Feel free to e-mail me if you are interested in trying our product next time! resslererin@gmail.com! Have a great day. 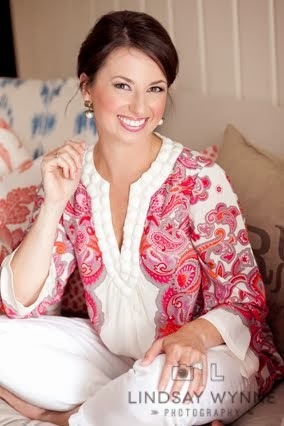 Congrats on your new journey of becoming a SAHM! Thanks for sharing! I definitely need to be better about using skin products! I just purchased the Bobbi Brown toner because I'm nearly at the bottom of my Murad bottle. I can't wait to start using it - especially since you still love it! How long does the Bobbi Brown tonic last? One bottle lasted me over two years! What's the best skin care products? Find the best skin care and facial spa products for your skin type from Advanced Spa in New York. Our products offer solutions for every skin issue.